Dr. Elise Jones is a native of Nashville having grown up in the Bellevue area. She saw a need for large animal veterinary care and decided one day filling that role would provide her a career with personal and professional satisfaction. She attended Hume-Fogg Academic Magnet High School which prepared her for the eight years of college at the University of Tennessee – Knoxville. During the first four years Dr. Jones acquired her Bachelors of Science in Animal Science along with a minor in Biology. She served as Scholarship chair for Sigma Alpha- agricultural professional sorority, Treasurer for Alpha Zeta – agricultural honor society, and Captain of the University of Tennessee Equestrian Team. She also completed two internships; one concerning freshwater aquatic environments and one in equine facilities management. The second four years were spent in the College of Veterinary Medicine pursuing her Doctorate of Veterinary Medicine. 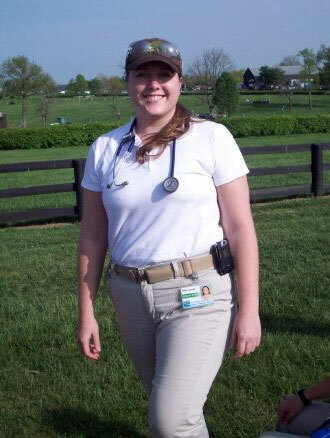 During this time she served as co-president of the equine medicine club, was an active member of the large animal emergency and colic response team, worked the 2008 Rolex 3-Day event, and presented research findings concerning intestinal parasites of songbirds’ native to the Great Smoky Mountains. Along with general veterinary courses Dr. Jones also completed courses in camelid medicine, equine internal medicine, wildlife disease, large animal handling, FEMA large animal disaster preparedness, and Veterinary Spanish. She also completed three externships during her final clinical year. Dr. Jones is an avid trail rider and has a special interest in preventative medicine and senior equine care. Dr. Jones is adjunct faculty for Lincoln Memorial University - College of Veterinary Medicine focusing primarily on teaching in the hands-on clinical skills labs and lecturing on integrative complementary therapies. She hosts senior veterinary students during their final year of clinical rotation so be on the lookout for fresh new faces during your appointments.